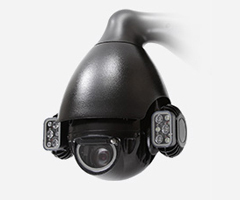 If you're looking to protect your business with PTZ cameras, we at IDS Security Systems Ltd can help. We supply and install a variety of cutting-edge surveillance systems in all kinds of different premises, and PTZ camera systems are an increasingly popular choice among our commercial customers. PTZ stands for pan-tilt-zoom. These state-of-the-art cameras are remotely controlled, and their design allows the operator to look around at different parts of the monitored location and zoom in on areas of interest. If you choose IDS for your surveillance camera system, we'll supply the cameras, install them ourselves, and keep your premises secure at all times with our 24-hour monitoring and engineering service. You can reach us at any time of the day or night by calling 029 20 753 251. Click here to learn more about the CCTV camera systems we can supply, or contact us now to request a quotation for your company's surveillance requirements.